“Real” means that the underlying values are inflation-adjusted. The indices are equated to 1 in December 1970 because that is the first month of the WLX. There’s an inverse relationship, as you would expect. But it’s a loose one because of marked shifts in the value of CAPE-10. The current value of CAPE-10 is about 32. If the relationship in Figure 5 holds true for the next 15 years, investors can expect real, annualized returns (with dividends reinvested) of 2 percent to 4 percent on broadly diversified mutual funds and stock portfolios. Not great, you say? Well, the current real return on Baa-rated corporate bonds is about 1.5 percent. It’s less than that for Aaa-rated bonds, Treasury issues, most CDs, money-market funds, and deposit accounts. So if you’re into buy-and-hold, the stock market isn’t a bad bet. Alternatively, you can try to pick the next “big thing” — Tesla, for example. Derived from Robert Shiller’s data set at http://www.econ.yale.edu/~shiller/data/ie_data.xls. Legendary economist and value investor Benjamin Graham noticed the … bizarre P/E behavior during the Roaring Twenties and subsequent market crash. Graham collaborated with David Dodd to devise a more accurate way to calculate the market’s value, which they discussed in their 1934 classic book, Security Analysis. They attributed the illogical P/E ratios to temporary and sometimes extreme fluctuations in the business cycle. Their solution was to divide the price by a multi-year average of earnings and suggested 5, 7 or 10-years. In recent years, Yale professor Robert Shiller, the author of Irrational Exuberance, has reintroduced the concept to a wider audience of investors and has selected the 10-year average of “real” (inflation-adjusted) earnings as the denominator. As the accompanying chart illustrates, this ratio closely tracks the real (inflation-adjusted) price of the S&P Composite. The historic average is 16.4. 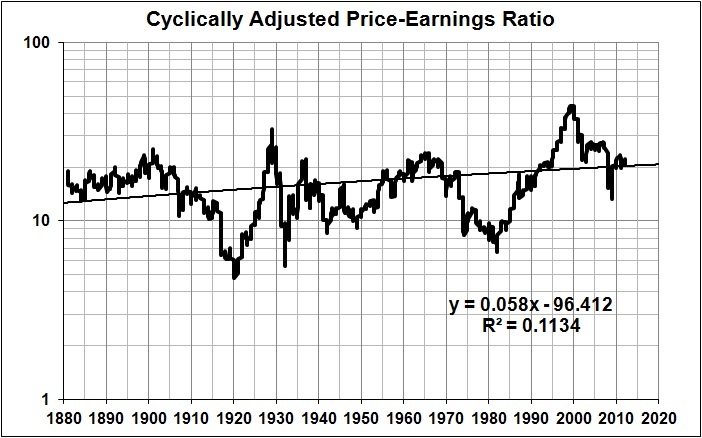 Shiller refers to this ratio as the Cyclically Adjusted Price Earnings Ratio, abbreviated as CAPE…. The problem with [the 10-year moving average of earnings] is that the typical or average business cycle has been significantly shorter than 10 years. According to data compiled by the National Bureau of Economic Research, economic contractions have become shorter and expansions longer in recent years. Furthermore, while the business cycle has lengthened in recent years, it is still considerably shorter than 10 years. Measured trough to trough, the average business cycle has been six years and one month for the most recent 11 cycles. Measured peak to peak, the average is five years and six months. The problem with using a moving average that is longer than the business cycle is that it will overestimate “true” average earnings during a contraction and underestimate “true” average earnings during an expansion. According to the National Bureau of Economic Research, the last recession ended in June 2009 and the U.S. economy is now in an expansion phase. Thus, the average earnings estimate used by the July 2011 CAPE is too low and produces a bearishly biased estimate of value. 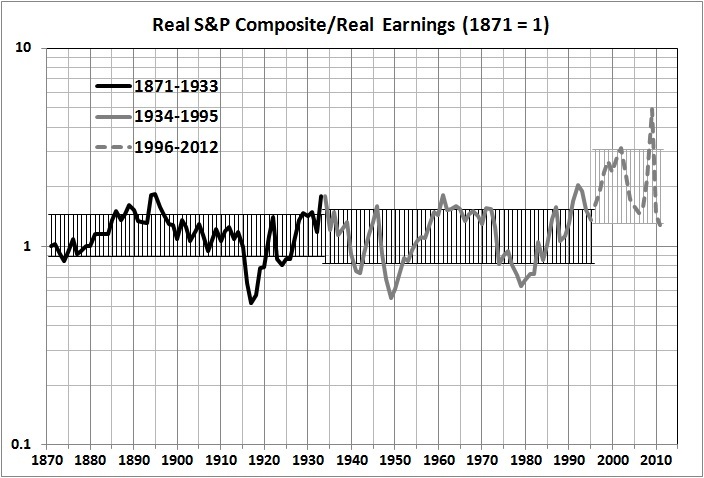 Using Shiller’s data, a July 2011 CAPE based on the average of six years of real earnings is 21.26 and the long-term average CAPE based on the average of six years of real earnings is 15.78. Comparison to this average indicates that stocks are overvalued by 34.7%. While still signaling that stocks are overvalued, the degree of overvaluation is much less than the 42.3% estimate provided by the July 2011 CAPE based on a 10-year average of real earnings. Derived from Shiller’s data set. The vertical bars show variations of 1 standard error around the means for each of the three eras. If I had fitted a long-term trend line through the entire series, it would tilt upward, as it does for CAPE. But that trend would be misleading because it would give undue weight to the stock-market bubble of the late 1990s and the artificially high P-E ratios resulting from the earnings crash during the Great Recession. In fact, a trend line for the period 1871-1995 would be perfectly flat. Moreover, as shown in the graph immediately above, there is little difference between the first half of that period (1871-1933) and second half (1934-1995). The standard-error bars for both eras are almost the same height and vertically centered at almost the same value. The second era is just slightly (but insignificantly) more volatile than the first era. As indicated by the standard-error bars, the P-E ratio for 1996-2012 is markedly higher than for the earlier eras. But, of late, the P-E ratio shows signs of returning to the normal range for 1871-1995. In sum — and contrary to the story that is peddled by “bulls” — I doubt that the real long-term trend of the P-E ratio is upward. Rather, the apparent upward trend reflects bizarre happenings in the past 16 years: an unprecedented price bubble and a brief but steep earnings crash. I would therefore caution investors not to buy stocks in the belief that the P-E trend is upward. For reasons discussed here, the long-term trend of stock prices is more likely downward.